I love creating and displaying door wreaths that are a bit different than the norm. 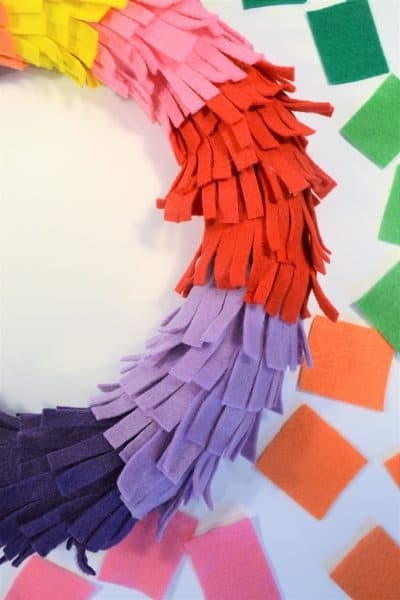 Today, I’m sharing an easy and creative rainbow fringe using felt! Make this easy wreath in any color scheme you want! 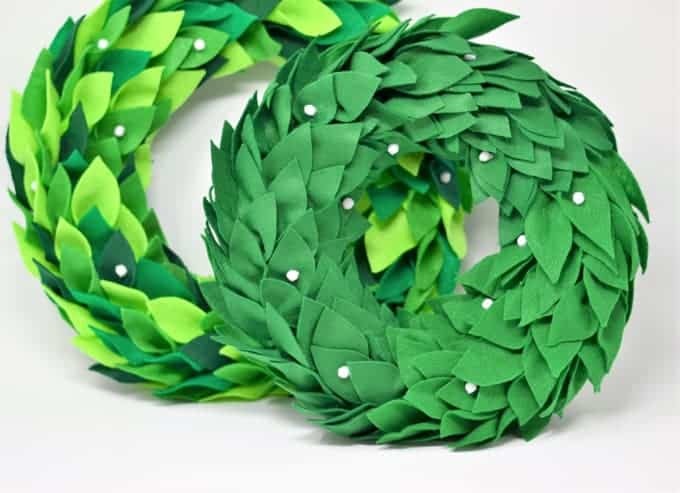 This blog is no stranger to felt wreaths. This leaves and lace felt wreath was one of the first, and this ombre version is still one of my most popular DIY projects. 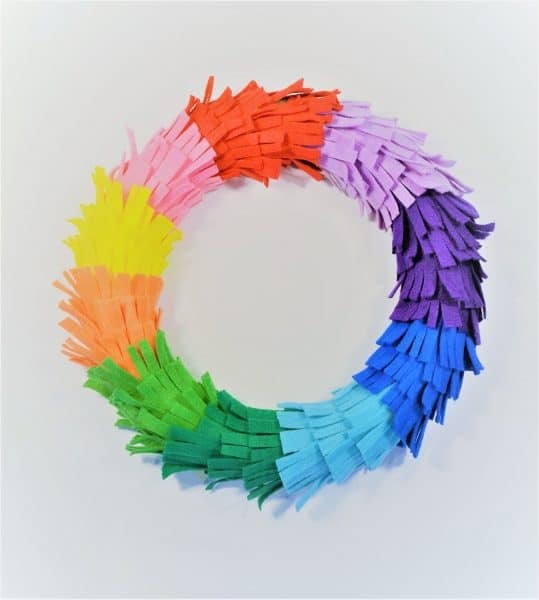 Wanting to jump on the always-popular rainbow bandwagon, I decided to create a felt wreath with a twist! 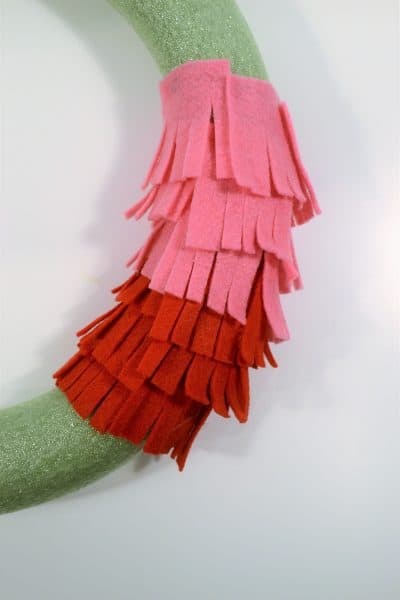 Adding some fringe to the felt pieces took almost no time at all, and adds a playful and whimsical touch to this felt wreath. 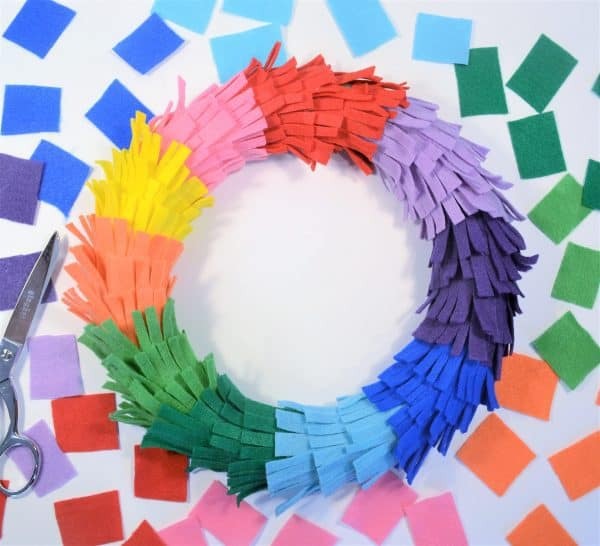 To make your own rainbow fringe wreath, here’s what you need…. 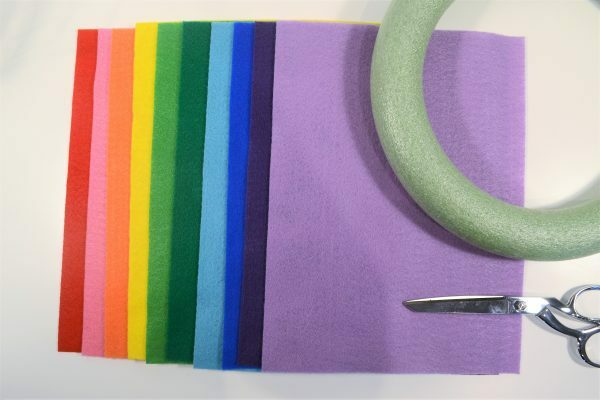 Step 1: I used 10 colors of felt for this (you can find an inexpensive assortment of felt here), but feel free to use as many (or as few) colors as you’d like. I took each sheet of felt and cut it into strips (6 strips per sheet), and cut each strip into rectangles (6 rectangles per strip). 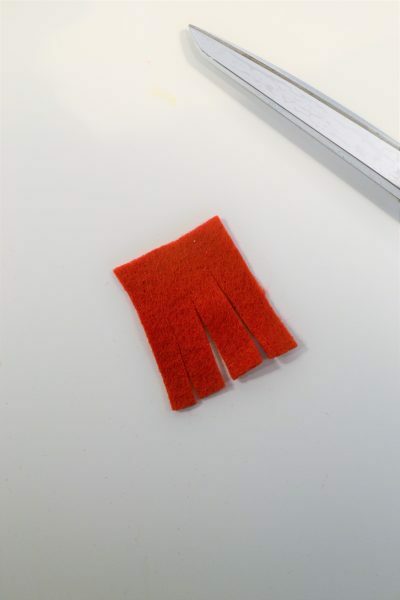 Step 3: Using a bit of patience (and a lot of hot glue), start gluing your fringed felt around your wreath. I did 3-4 rows of each color; in each row, I used about 4 pieces of felt. Work your way around the wreath (this took maybe an hour or so), and you’re done! I really love how this turned out! 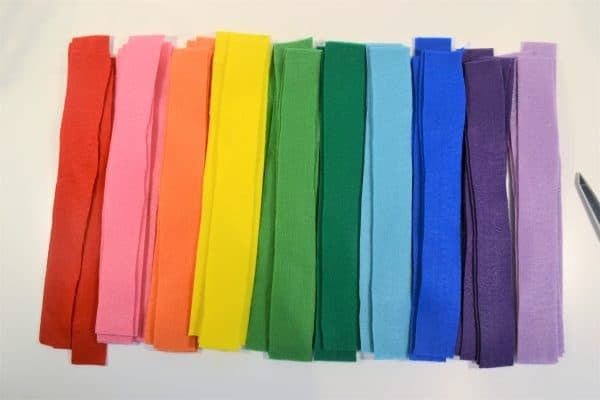 It’ll be adorable in my daughter’s room, but would also be super-cute as decor for a rainbow-themed party or paint party! 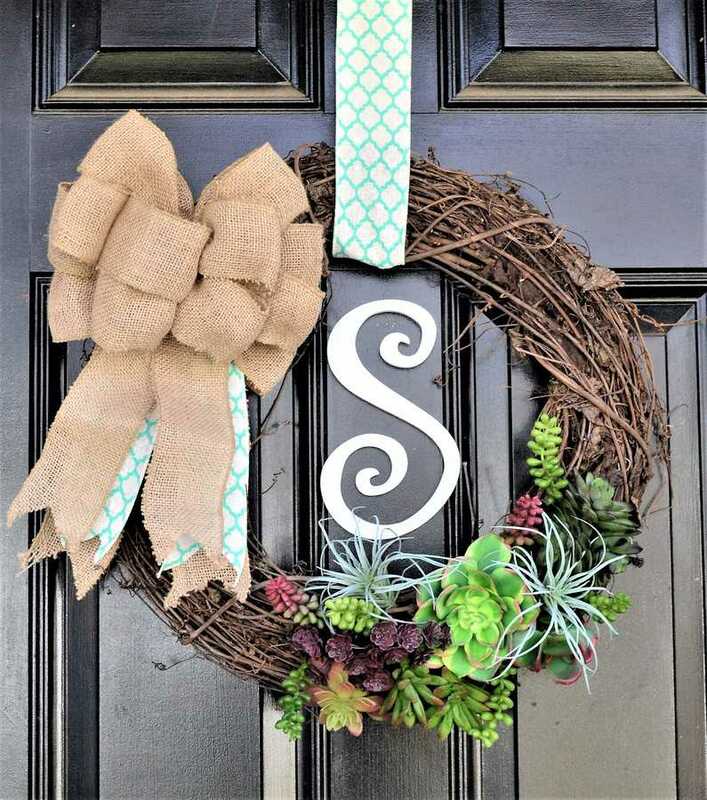 We have lots of wreath ideas that are perfect for your home decor! Tutorial and video for how to make this darling felt magnolia wreath! A spring succulent wreath is a great warm weather wreath idea! Thanks for reading all about my door wreath ideas! Have a crafty day! 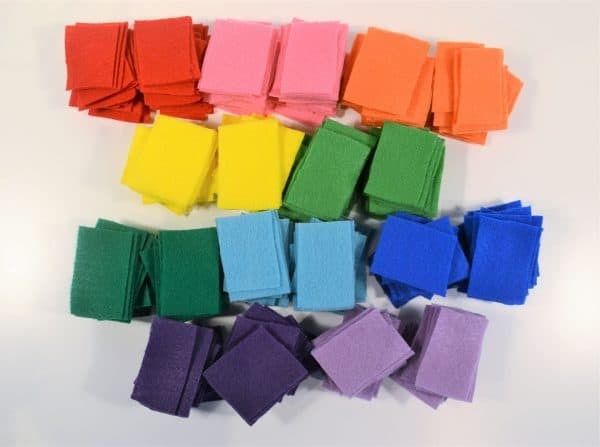 I have a lot of felt pieces and would love to try my hand at this. Just need a few more colours to create the pretty rainbow effect you did here. Love this wreath inspiration! Going o make one for my great granddaughter .She will soon graduate from preschool I am going to put a foam letter of her name in glitter it will be a gift for her to go in her room.They are beautiful.